We’re so lucky, little brother! We had a great childhood filled with amazing moments. Always playing around and having fun. Our parents were the best, they always seemed to know exactly what to say and do. And our amazing and warm family that always got together on those special days. But, I’m afraid to say that, out of the two of us, you’re the luckiest. It’s true; you’re the luckiest because you also have a sibling who absolutely adores you and would do anything for you. Someone who is capable of moving heaven and earth for you. I adore you, little bro! Have a wonderful birthday! Big brother, you are the most inspirational person I know, and you deserve nothing but the best on your special day. Happy birthday and here’s to another great year! 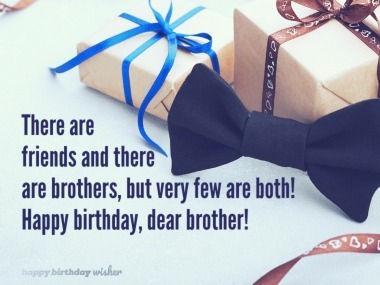 To the best brother in the universe, I can only wish your dreams may come true. 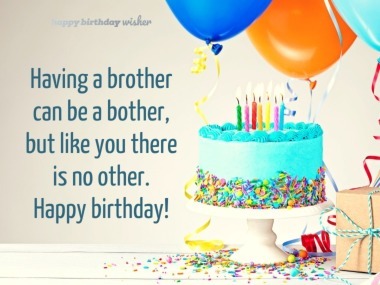 I hope you have a great birthday, big bro! You are a wonderful brother and an amazing person who deserves but gifts and lots of love. And on this special day of yours I will give them both to you! I hope you have a fantastic day and a fantastic year to come, big bro! You may be older now. You may be all grown up. You may have a job, a career and a family of your own. You may be old enough to drive and to have a drink. You may have grown up talks and meetings. But to me you haven’t changed a bit. You will always be my little baby brother. When I was little I thought you were the strongest person on earth and today I know for sure. You are the strongest human being on the planet and the one I most admire! One day, I asked our parents for a toy and instead they gave me you, a little baby boy that I'm proud to call my brother. Happy birthday! Earth has travelled once more around the sun, which means it’s time to celebrate again. Many orbits ago I was an only child, but one brilliant day, on this drifting space rock, a new baby was born. He was blessed with stardust and I was blessed to hold him in my arms. Your eyes were brighter than a thousand supernovas, deeper than the deepest black hole and as powerful as the big bang. You were a tiny little star, which grew to amass a galaxy of your own. But to me little brother, you will always be the sun. I know a great deal of the universe is still to be discovered and there are many unheard of places to be explored. But I must say without a doubt, there isn’t anyone like you in it. You are the best big brother in the universe! Have an amazing birthday!